So away we go down to Mexico by way of Zia’s Kitchen. I bought 6 fillets of Tilapia. You can use Mahi Mahi as well. They were large so I ended up using 4 and freezing 2. We were 5 adults and 2 children. I only cooked half of them by the time everyone had stuffed themselves with at least 2 tacos each, so we had leftovers with a friend the next night serving the next batch of fish over the Jicama Salad. No more fried food for me for a while! I cut them into fish taco sized pieces and marinate them overnight in a large Tupperware. 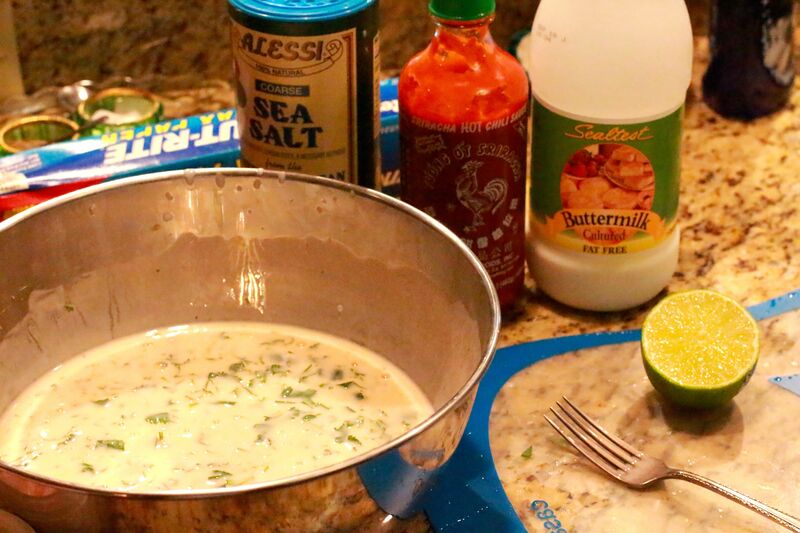 The marinade is a mixture of Cilantro – a whole bunch chopped with stems removed – Buttermilk (that whole container pictured here – I think a quart?) a pinch or 2 of Sea Salt the juice of half a Lime and a splash of hot pepper sauce. I use Sirracha. 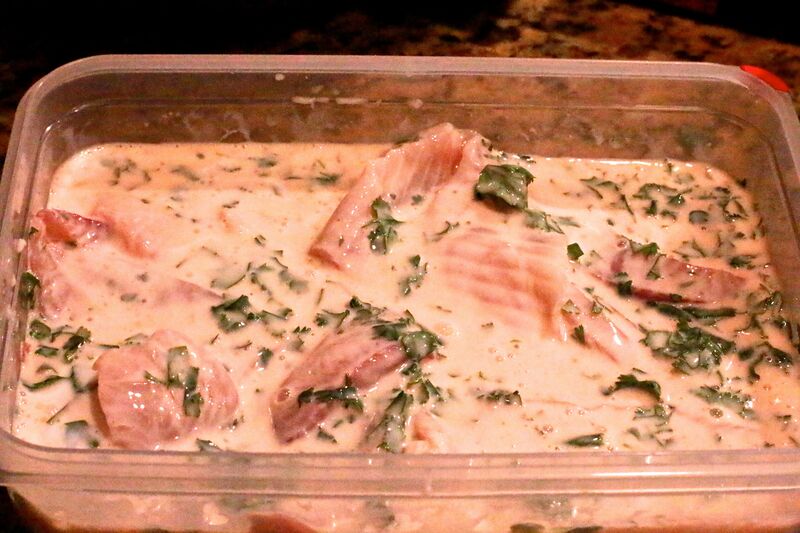 Don’t get crazy and add to much lime juice as citrus “cooks” fish and makes it into ceviche. Just a hint. If you are making a smaller batch use less than half a lime. The next day when the meal is going and apps have been munched on, fry the fish right before serving so it’s nice and hot. Put Gluten Free AP Flour (obviously original recipes call for regular flour, but luckily for me GF works fine) in a bowl and a 2 pinches of sea alt, mix around, and dredge each piece so its covered before you fry it, and don’t put to many in the pan at once. I do it in batches of 4 – 6 at a time, depending on the size of the pan. Amount of oil in the pan is not enough oil to make them deep-fried, but enough that half of them are submerged. Make sure the oil is HOT so they crisp and brown up fast. It should take about 2 minutes or less, flip and do the other side. The trick is not overcooking the fish. It should be crispy outside and flaky on the inside. Voila! I have a whole counter or table set up with everything, sides, salsa, cilantro, jalapeños etc etc….so people take the corn tortillas – which you have wrapped in foil and warmed in and oven, and build the taco just how they like. Suggest the Baja Sauce as a definite though! On that note…. I have no photos of the making of the Baja Cream Sauce. The recipe however – as I make it – is so simple yet I get rave reviews without fail. 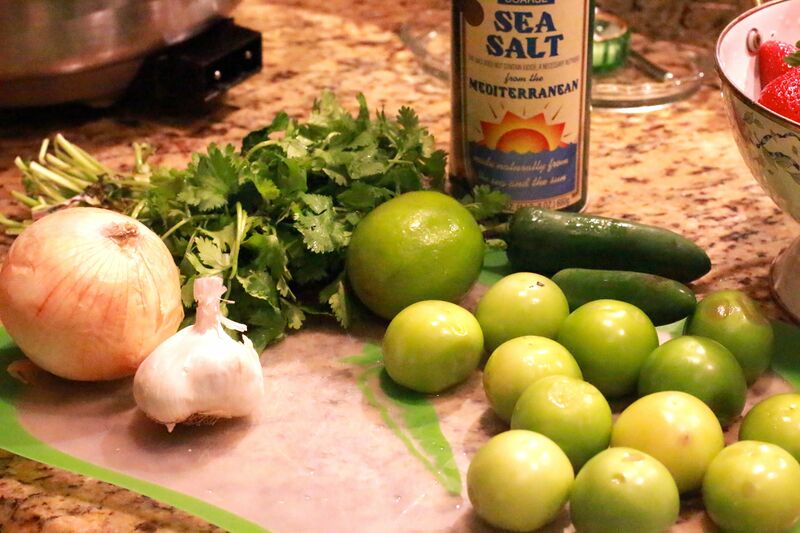 To make the Baja Sauce use: Creme Freche – 2 containers, the zest of one lime, the juice of an entire lime, a dash of sea salt. Mix and chill for a few hours. May be made up to 2 – 3 days in advance but I normally do it day before. Let it come to room temperature before serving. I also use it to dress the cabbage. 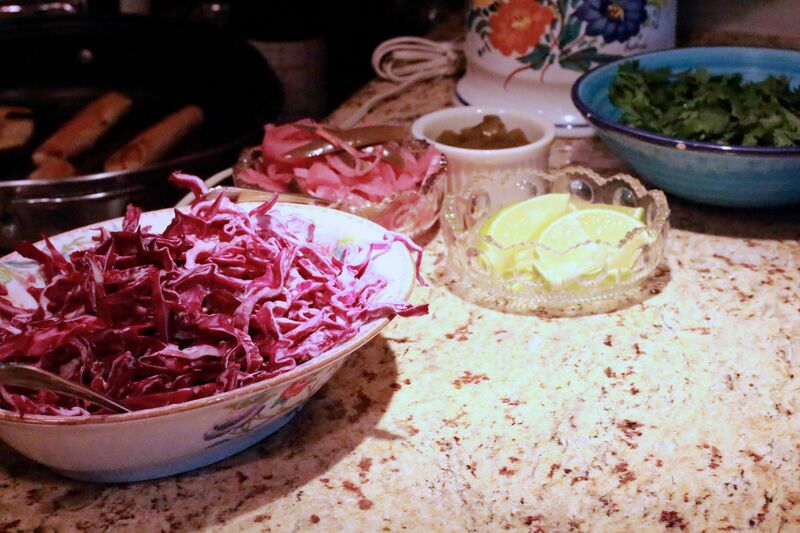 I take a small organic red cabbage (or green if you prefer) and slice it up thin, put it in a bowl and dress it lightly with the Baja Sauce. You should hardly notice it, not a heavy hand, it just gives the crunchy cabbage an extra zing. Example of the options I set up. 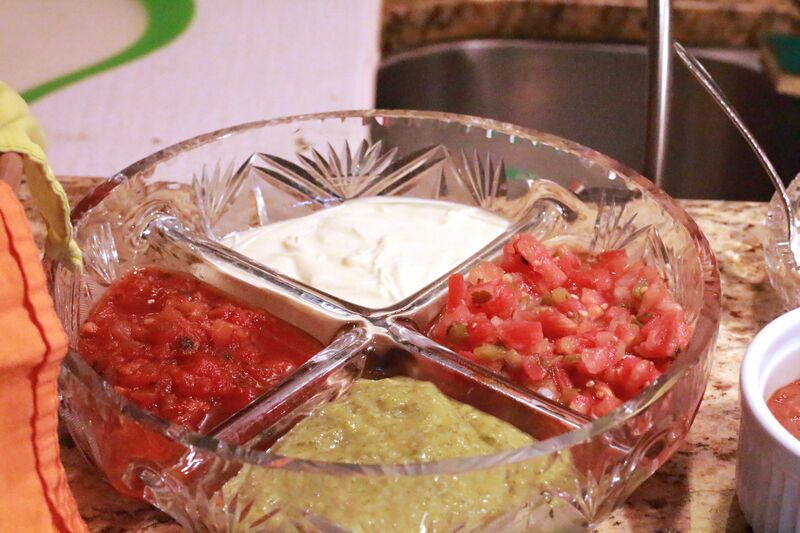 In this AWESOME divided dish that was Great-Nonna’s I have (clockwise from the top) Baja Sauce <creamy and tangy> , Pico de Gallo <mild>, Salsa Verde <mild or spicy, mine has a bit of a kick to it> and Pineapple Chipolte Salsa <spicy>. Covers all the bases. Next is the Spicy Black Bean Dip and some Sour Cream that I bought from Fresh Market and Guacamole that I made. I would give the recipe, but everyone has their own way of making it. I in fact have 5 or 6 gold standard ways I make it depending on the situation, but for this night I went basic. Avocados, Cilantro, Lime Juice and Sea Salt. 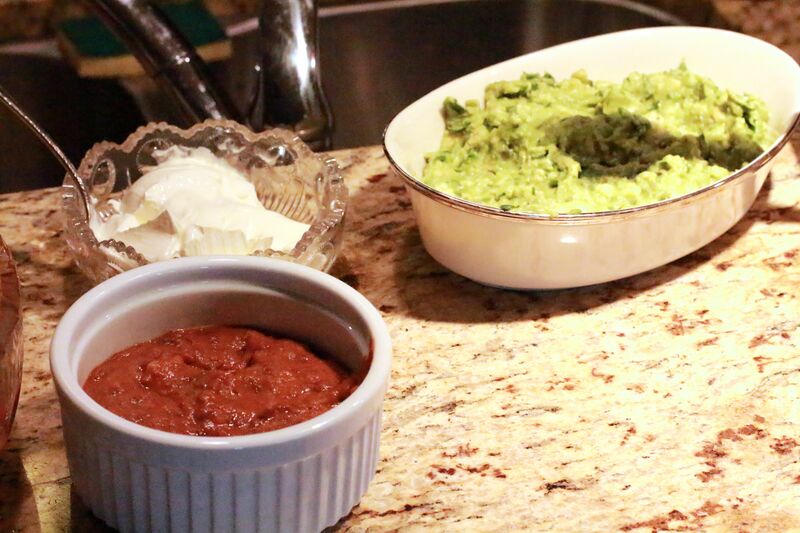 Fresh Avocados that are flavorful need very little added to them for a good guacamole! They are set out for appetizers with the chips, Taquitos and Fried Queso. 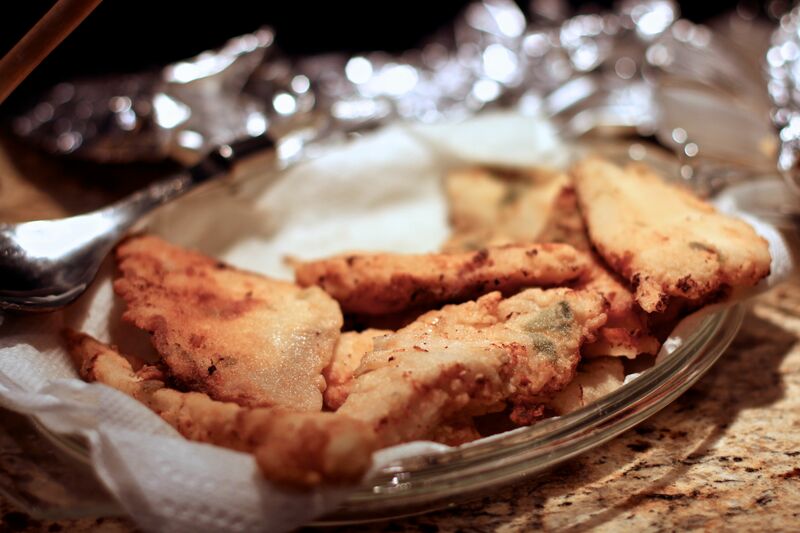 Fried Queso: Get a block of Firm Queso that will say it’s for frying. It’s a certain consistency. Slice into pieces about 1/4 inch thick and fry up in a skillet for a few minutes on each side. They will get brown, or dark brown and crispy on the outside and gooey cheese on the inside. People tend to load up on them and the kids LOVE it. Taquitos: There are SO many different kinds of taquitos to make, the filling can be as simple or gourmet as you like. For the kids I went super simple. The day before I grilled up 2 boneless chicken breasts with no seasoning other than S & P and then I minced it up, mixed in shredded cheese. The 4 cheese mexican blend you get in the grocery works great. Microwave some Corn Tortillas wrapped in a paper towel to make them easier to work with. Put some filling about an inch from one end, then roll tightly. My trick, have the “seam” of the roll facing down, and then put in 2 toothpicks to secure them. Carefully place them in the skillet with hot oil seam side down. When that side is crispy it won’t open up and fall apart. Carefully remove the toothpicks and turn them over to crisps up the second side. Serve hot and people can use any of the myriad of dip options for them. WIn Win. Also on deck , the dressed Cabbage, small bowls with Jalapeños, Sliced Limes, Pickled Red Onions and Jalapeños and a bowl of Cilantro leaves. I am VERY particular about my cilantro. I HATE when there are any of the stems in the Cilantro I use in Guacamole, or for garnish etc. For marinades, and something that will be pureed a little stem is okay, but otherwise I pick the leaves off one stem at a time. A little OCD of me? Perhaps. I will tell you, I can’t WAIT until Littledude is old enough to help with this task, it’s just time consuming…but in my book, worth it! For my Salsa Verde I use what is pictured above. Half of a small white oinion and a few cloves of garlic (leave skin on). Put all of them on a broiler pan and set under the broiler. Let them char on one side, remove and turn, and then set them on a lower rack to continue cooking until soft. When they are done put all the ingredients – including the juices – in a powerful blender or Cusinart ( I only have my Nutri-Bullet at the moment but I have to admit, was better than the blender ever was) Add an entire bunch of cilantro, washed and large stems removed. A few pinches of sea salt and blend. For less spicy use only half a jalapeño or more tomatillos. This equation gives you a salsa verde with a kick. That’s it. Also can be made the day before – just let it come back to room temperature before serving. Another simple one that is such a great – and healthy salad. 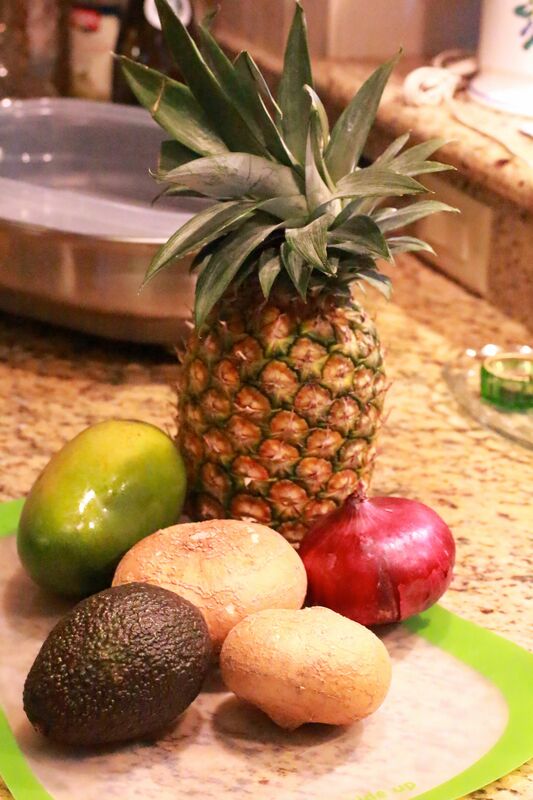 I use a Pineapple, 2 medium Jicama (or 1 large one) a medium Red Onion, Mango and Avocado. I make this a day ahead and keep in a large Tupperware. However if you do this do NOT add the avocado until right before you serve it so it stays fresh and pretty. THIN slice the Red Onion. Peel, wash and Julienne (long thin strips) the Jicama. Chop the Mango and Pineapple into bite sized pieces. 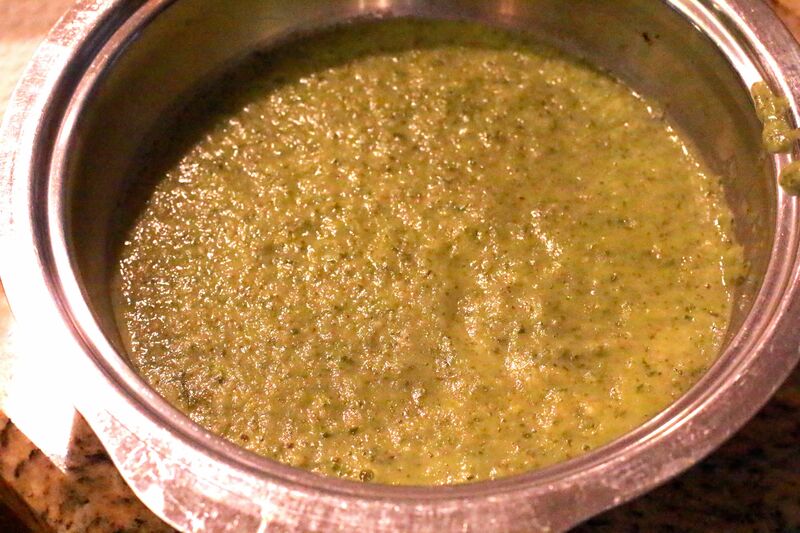 Mix in large bowl by hand and dress with a dash of lime juice, some champagne vinaigrette and a splash or 2 of olive oil. This can marinate together overnight and I think it’s better that way. Chop the Avocado and add before serving. 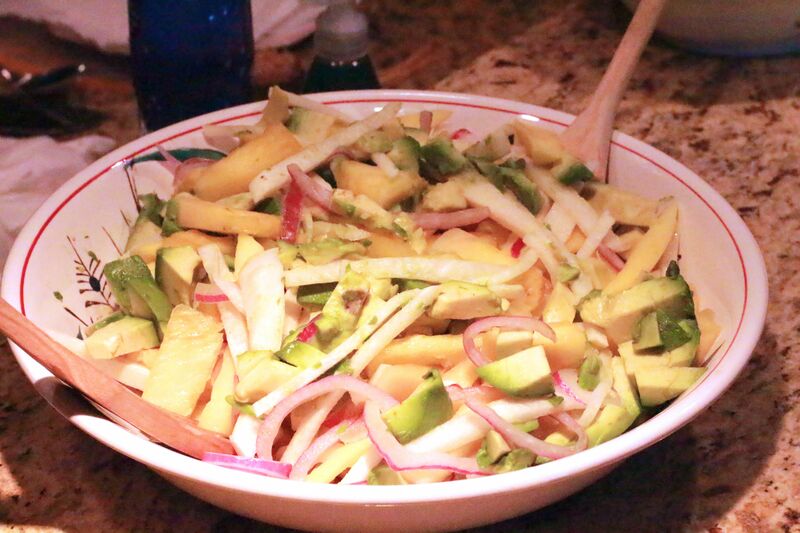 The sweetness of the fruit, crunch of the Jicama, sharpness of the onion and mild coolness of the Avocado makes this a real favorite of mine in the summer. Other serving ideas: The next day I had it for lunch with some leftover diced chicken and some of the cabbage. That night for dinner I mixed in the cabbage and served pieces of the freshly fried fish on top, garnished with some of the Baja Sauce, Cilantro and Salsa Verde on the side. And that folks is that. Zia’s Mexican Fiesta Fish Taco Dinner. After multiple servings of this meal over the years and all the reviews I can safely say this is a stand out and an all around! Simple albeit time-consuming. Fresh and except for the fried fish and Tacquitos – on the healthy side, and in the entire menu I only had to alter ONE thing to be Gluten Free and that’s the flour. I had an idea and have decided next time I am going to try Coconut Flour and see how that goes. However it may be a while before I undertake this meal again, as you can see it’s a 2 day ordeal of preparation and cooking, but for someone I love it is worth it. Doesn’t hurt that it’s one of my favorite meals as well!